Playing blackjack online is a more viable alternative to playing live games at your local casino. Not only does Internet play give us access to gaming variety and convenience, but we are also privy to the passionate and exciting competition which comes with playing with other players. If you are looking for additional thrills, all the online casinos we recommend offer thoroughly enjoyable blackjack tournaments on a consistent basis, to give players the chance to prove their worth as champions of the game of 21, and win real money. Note: This page is intended for our international readers only. Online casinos are banned from offering their services in Australia as of September 2017 following the introduction of the Interactive Gambling Amendment Bill 2016, so the content on this page is informational in nature only for Australian readers. The majority of blackjack tournaments are played to win real money, and the typical competition will have an entrance fee (with the exception of free-roll tournaments), multiple rounds of play and multiple games in each round, multiple tables to split the large number of potential entrants, minimum and maximum bets, and cash prizes. All those factors will vary according to the type of tournament being played, but the overall aim remains the same. Essentially, we are playing not only against the dealer, but every other player at your table, too. Every player who signs up for the tournament is given the same amount of starting chips, for example, $5000 (this is the play money, and can’t actually be won). Your goal is simple: beat the dealer and win more money than the other players in the game to be crowned blackjack champion. We aim to make the most of our designated bankrolls, and come out ahead in order to win the prizes on offer. The entry fee for this particular tournament is a small fee of $4, and the prizes to be won are as follows: 1st: $40, 2nd: $30, 3rd: $20, 4th: $10. There are a total of 120 participants and the competition takes place over three distinct rounds. Players are seated randomly across multiple tables of six to seven people. Each player begins with $2,000 in virtual chips, and six hands are played in each of the three rounds. In Round 1, the minimum bet is $10 per hand and the maximum betting limit is $250. Remember, we are trying to win more money than the other competitors, and not only beat the dealer, so smart strategy on how much to bet per hand is crucial. At the end of the six hands in Round 1, the top 14 players with the most amount of virtual chips win through to Round 2. The 14 qualifying players are now seated across two tables, and competitors begin with a new and increased bankroll of $3500, and betting limits of $50 and $500. After the six hands are completed, the top seven players progress to the third and final round, where everyone is seated around the one virtual table. All begin with $5000 in chips, and the min and max limits are raised to $100 and $1000, respectively. At the conclusion of the sixth hand, the top four players with the most $$$ are awarded their respective prizes. Whatever the allocated starting amount is in any given tournament, we need to up our ante and play with some added aggression in regards to how much we wager per hand, if we are to succeed in the competitive blackjack tournament environment. Even a sizeable return of, let’s say $500 in virtual chips, from the first round of the above tournament’s play, might not be enough to beat someone who consistently bets $150 per hand and wins more often than not. If approaching the end of a round and you sit well behind the top players, putting forward significant bets is required in order to stand a chance of winning. And if you find yourself as one of the chip leaders towards the end of a round, it is up to you to decide how to protect your lead. Players have a limited amount of time to make their bets and play decisions, making the game all the most exciting. Free-roll Tournaments: No entry cost; simply join in, have fun and see how your game-play stacks up in the competitive environment. Such tournaments often offer small cash prizes, or free entry to paid tournaments, with much larger prize pools. Buy-in Tournaments: Purchase a virtual seat and compete until one player remains. Buy-in tournaments usually offer higher stakes than other blackjack events, and thus tend to attract a more refined, experienced type of player than most free-roll tourneys. So if you want to play for sheep stations, you had better bring your A-game. Sit ‘n’ Go Tournaments: Sit at a virtual table that starts when the required amount of players join. After a certain number of hands, the player with the smallest bankroll is eliminated; this process continues until there is only one (sometimes two) competitors remaining. SNG tournaments are fast and fun, and come in many different varieties – from single-table satellites, to multi-table events that can offer some very tasty cash prizes. Pre-set Tournaments: While Sit-n-Go games begin as soon as the required number of players are seated, pre-set tournaments have scheduled starting slots. If you fail to show up on time, that’s it – you are out of the comp. This is a more traditional style of play, often favoured by the purists and players with more conservative, long-sighted betting strategies. 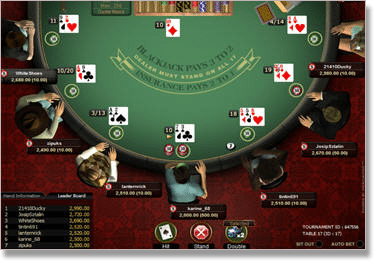 Why Play Online Blackjack Tournaments? If you are based outside of Australia and looking to hone your competitive gambling and blackjack skills against other players, seriously consider taking part in a tournament. Not only are they entertaining and add extra spice to the games of 21, but for small entry fees, you can stand to win large amounts of cash. The lack of risking a significant loss is a highly attractive feature of these tournaments; by paying a specific amount suited to your budget, or even playing free-roll tournaments, you give yourself the chance to pocket the top prize through smart and stimulating game-play. And if you don’t make it all the way, there’s nothing stopping you from entering another comp and having another shot at glory. Choose a game comfortable for you, play with some healthy competition, and enjoy the invigorating experience that comes with playing in these tournaments.